One of the best days of the year is being able to take the cover off of the pool after a long winter and getting everything set up to have family and friends over for awesome summer get togethers. If you are basketball buff and a pool owner then a great way to entertain your family or guests is to invest in a pool basketball hoop. Pool basketball hoops provide hours of fun while allowing you to remain cool in the hot summer weather. With so many pool basketball hoops available to buy it can be overwhelming deciding on which hoop is right for your pool. That is why we have compiled our top five pool basketball hoops so that you can get a great hoop on any budget. Whether you plan to spend $20 or $200, there are great options that offer loads of fun. Our first entry in the cheap pool basketball hoop list is the Coop SwimWays Hydro Spring Basketball Hoop. Coming in under $25 this is great pool basketball hoop for those who just want to have a hoop to play with in the pool and are not looking for a full-size basketball experience. The Coop SwimWays Hydro Spring Basketball Hoop is inflated so that it floats on top of the water allowing you to shoot from anywhere in the pool. The Length, width, and height of this pool basketball hoop is 24.4″ x 24.4″ x 20.47″. Basketball and carry bag are included. Stumptown Sportz has created a great inflatable pool basketball hoop that is a level up from the Coop Swimways Hoop we reviewed above. The Stumptown Sportz Inflatable Pool Basketball Hoop is 44 inches tall and 40 inches wide, making it a good size. It is inflatable as well and will sit on top of the water while in use. 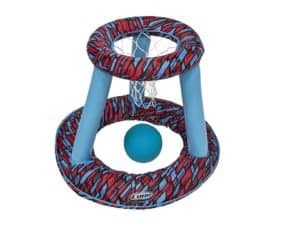 The Stumptown Sportz Inflatable Pool Basketball Hoop also comes with a lot of extras including two mini basketballs, an air pump with needles, and a carry pouch. 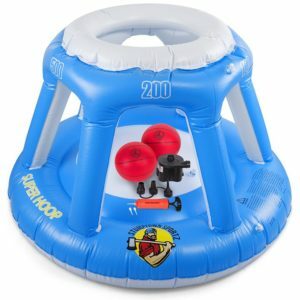 At around $40, the Stumptown Sportz Inflatable Pool Basketball Hoop is more expensive than the Coop Swimways, but you do get a lot more for your money. Overall, you can’t go wrong with this hoop. Our most expensive pool basketball hoop on the cheap list is the Poolmaster Pro Rebounder. This hoop is right under the $100 mark and perfect for those who want to spend a little more money for a better hooping experience. The Poolmaster is the first pool basketball hoop on our list that is not inflatable. It actually has a fill base that you fill with water or sand and place on the deck or cement on the side of your pool. If you don’t have a deck or other level area around your pool then this hoop will likely not work. 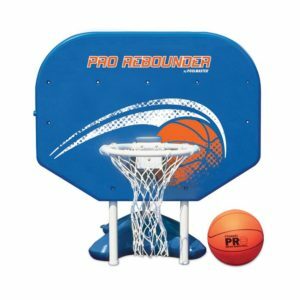 We consider the Poolmaster Rebounder Pro Pool Basketball Hoop to be the first “real” pool basketball hoop on our list and if you have a little extra to spend it is well worth the price. Our first entry into the high(er)-end of pool basketball hoops is the Dunnrite PoolSport Swimming Pool Basketball Hoop. This pool basketball hoop has a water fill base that attaches directly to the backboard. The fill base helps to keep the hoop stable and upright, but we do not recommend dunking on the Dunnrite as it could still tip and cause injury. On the plus side, the Dunnrite is the first pool basketball hoop entry that has a full size rim. This allows you to use real basketballs in the pool if you choose. 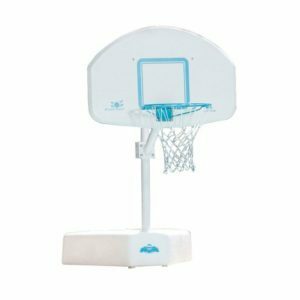 The bottom line is that the Dunnrite Pool Basketball Hoop is a great choice if you want a real basketball experience in your pool without breaking the bank. We have reviewed many Lifetime basketball hoops on bestbasketballhoops.org over the years. For those that are unfamiliar, Lifetime is a popular manufacturer of recreational basketball hoops that are generally friendly on your wallet. The Lifetime 1301 Pool Side Basketball System continues this tradition as it costs right around the $150 mark as of this writing. 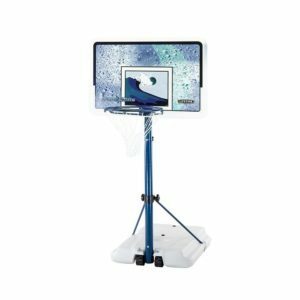 With the Lifetime 1301 you get a 44 inch backboard and a height adjustment mechanism that allows you to adjust the height of the Lifetime 1301 from 4 feet to 6.5 feet. This makes it a more versatile choice than some of the other pool basketball hoops on this list. Lifetime also used a rust resistant coating on the metal pieces to help ensure a long lifespan for this basketball hoop. This along with the other features makes the Lifetime 1301 Pool Basketball System a great choice for any pool owner. Our second entry from Dunnrite is the Splash and Shoot Swimming Pool Basketball Hoop. This hoop is a more expensive alternative to the Dunnrite Pool Sport is full of features and quality components. 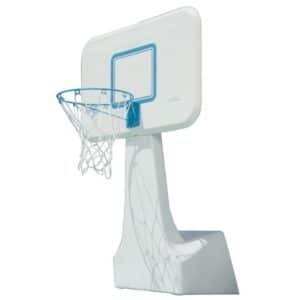 The Splash and Shoot features a 43 inch by 28.5 inch polycarbonate backboard that will not break. It also has a telescoping pole that allows you to adjust the height of the hoop so that it will be a perfect fit in your specific pool setup. When filled with water the Dunnrite Splash and Shoot weighs in at 200 pounds making it a secure pool basketball hoop.